NICE Oview For Electric Gates. Unit for control, programming and diagnostics for devices equipped with BUS T4 connection or remotely via GPRS thanks to the connection with your PDA, Smartphone or PC. The multi-function display O-view is connected directly to the compatible control unit via a BUS T4 cable (supplied), enabling access to all control unit parameters to adapt the system to all needs. A single and simple programming mode with intuitive menues valid for each product, with no need to consult the specific instructions. By connecting O-View permanently to a control unit or group of control units via BUS T4, a newtwork can be created for local or remote centralised management. O-View powers up and automatically recognises all devices on the network as soon as it is connected, displaying only the specific parameters of the device on with to intervene, eliminating any irrelavant or redundant information. In the case of several devices on the network the BUS T4 address is identifiable by means of a text lable personalised as required, enabling rapid recognition of the associated device. Thanks to the built-in clock, it is possible (with integrated backup battery) to program delivery of commands at a set time, for example to automat opening and closing of complex industrial and commercial systems or for the creation of "scenarios". A practical wall-mounted support (supplied) makes it even more convenient. The system can be protected on two levels, for example by means of a user password and installer password, to guarentee differentiated access to more reserved function and increased safety. O-View is your portable office, and can be connected just when programming or for maintance, or can be installed permanently on site to exploit all the benifits of local or remote centralisatied management. Bluetooth connection module for O-View interface. "O-View Software Suite" enables connection via PC or PDA to O-View in the vicinity of the system, to intervene on the control units on the BUS T4 network. Maximum connection didtance 15m. The interface of "O-View Software Suite" has been specially designed to enable rapid access to all parameters of the connected devices without the need for physical access, as well as quick diagnostics of malfunctions by consulting the event log, all the most practical and intuitive way possible. The O-View control function has been expanded: in just one PC screen, all applications connected via BUS T4 can be controlled, even in large numbers. 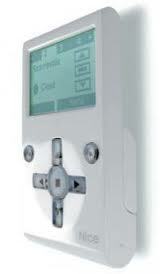 In addition to the benifits of the OVBT module, the automation or network of automations can now be controlled via GSM by connecting O-View to the system via BUS T4 technology. A GPRS connection also enables connection via the internet to O-View to ovtain all management functions offered by the software from any location with no need for presence on site. The user can remotely control the sutomation via GSM, from any of the enabled numbers, and check status, such as opening a gate by means of a phone call or by sending 4 different controls via SMS text message, with the security offerend by entry of a unique password. Supplied with a 2m BUS T4 cable.